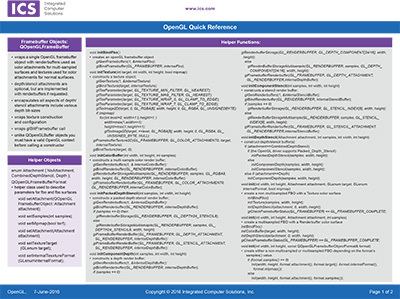 Here is a handy reference chart to show how Qt calls map to OpenGL for QOpenGL FrameBuffer. Please complete the form to have the download link emailed to you. This quick reference contains essential map of calls that is useful to Qt Developers working with the QOpenGL FrameBuffer class.